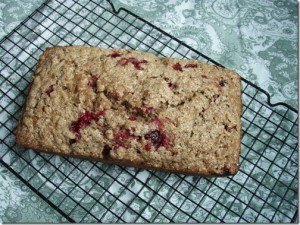 This cranberry orange walnut bread is a healthy way to curb a sweet tooth. 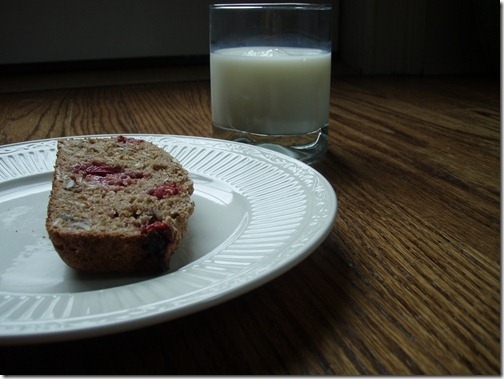 Made with whole wheat flour, oats and applesauce, you won’t feel bad indulging. While we’re off exploring the Emerald Isle, this girl will be heading to her favorite place on earth. 3 other dogs, a fenced in 1 acre yard, extra treats, wet food added to her dry food, and a plethora of comfy dog beds to choose from. What’s not to love? She goes a little nuts. So for the first hour she’s usually quarantined outside to let some of this energy out. Then there’s the whole night-time issue of not sleeping. Again, at home she sleeps through the night no problem. 8 or 9 hours and wakes up when we do. At my parents house surrounded by 3 other dogs, it’s a different story. If they so much as stretch in the middle of the night she’s up, at their bed, and poised to play in about 1 second flat. As you can imagine that gets old real quick at 2am. And lastly, there’s the whole part about her needing to be let outside alone. Ginger tore one of her ACL’s when she was 1. We’re pretty sure she did it by chasing my parent’s greyhounds around the yard. Suffice it to say they’re a little faster than her. You know, with that whole racing thing and all. Since that lovely vet bill we don’t take our chances anymore. There will be 4 dogs in their house this next week and none of them can be let outside together. That turns “going outside” into almost a 45 minute ordeal. This came out so good. I wish you could all taste it through the screen kind of good. Just sweet enough from the turbinado sugar but also, a nice tartness from the cranberries. And the orange. 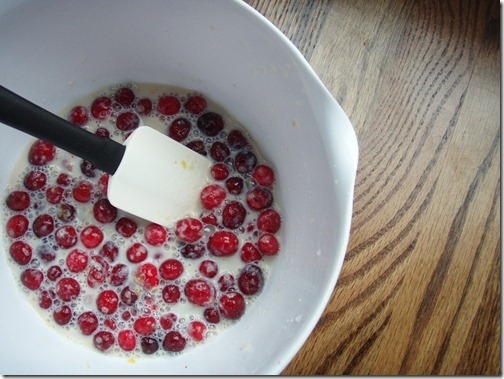 Is there a better combination than cranberries and orange? Well pb and chocolate maybe, but for today I’m sticking with cranberries and orange. I’m actually quite proud of this because while I have no problem winging it in the world of cooking, baking has kind of always scared me. I’ve followed enough recipes to know the basic ratios though so I finally threw caution to the wind yesterday and just went for it. You should too. It’s delicious. Had to taste one slice. To make sure it was good enough for mom & dad of course. 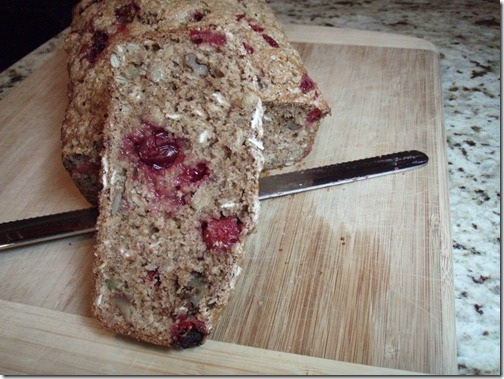 This cranberry orange walnut bread is a healthy way to curb a sweet tooth. 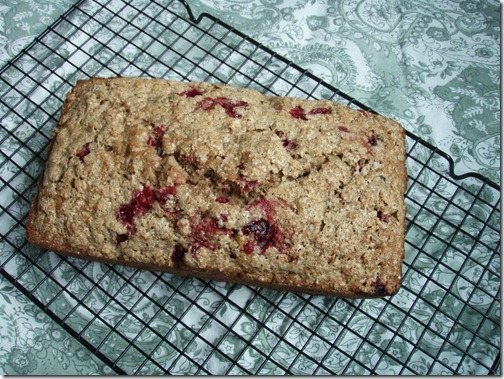 Made with whole wheat flour, oats and applesauce, you won't feel bad indulging. Combine first set of ingredients in large bowl. 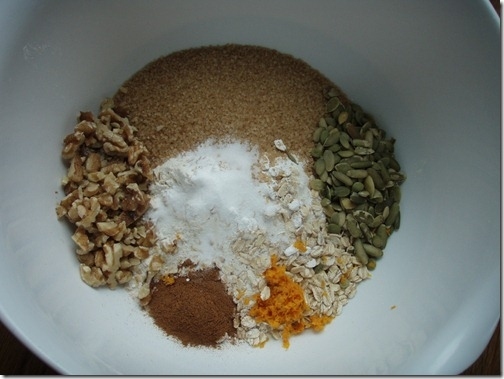 Combine second set of ingredients in small bowl and mix to combine. 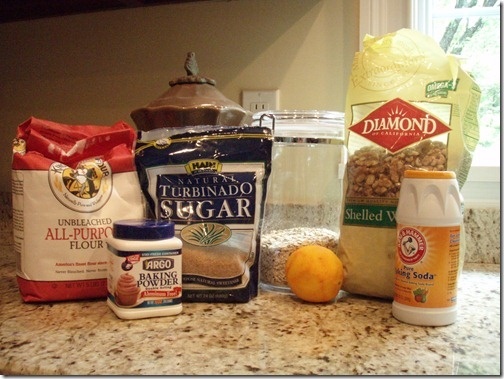 Add wet ingredients to dry and mix until incorporated. 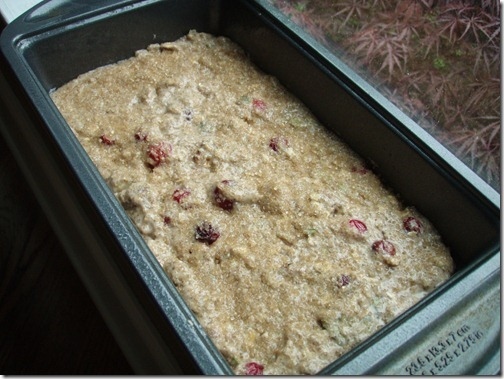 Grease a loaf pan and pour mixture in. Sprinkle with about 1 tablespoon of turbinado sugar on top if desired (highly recommended for a sweet crunch). Bake for 50-55 minutes, until toothpick comes out clean. Let cool for 10 minutes before taking out of pan. hahaha! Dogs crack me up. Bungee tries to do that with my in-laws’ dog, but their dog is a scaredy cat and hides in a bedroom the whole time Bungee is over, so things go pretty smoothly. I love hearty breads. That looks great. By the way, I hope your dog has fun on your trip. Nothing like being spoiled by Grandma and Grandpa! 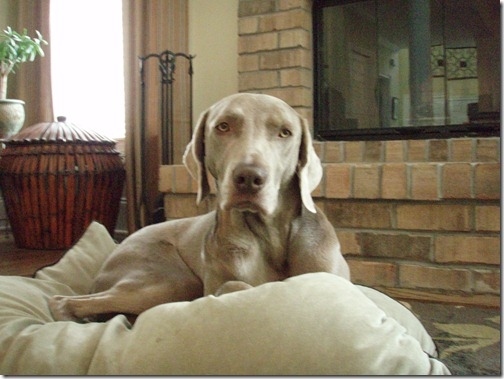 AHHH ….. No on another dog…..Yummm on the cranberry bread.